If you are struggling with student loan debt and thought you might get a break, think again. This week, Education Secretary Betsy DeVos quietly issued a decree reversing actions by President Obama to ease the burden of people struggling to pay off those loans. It focused on the servicing companies that collect loan payments for the U.S. Department of Education. Her action might have gotten lost in the bigger debate of the deteriorating bromance between President Trump and Vladimir Putin and viral videos about United Airlines, but it is certain to affect more people directly. Basically, loan contracts had gone to companies that could prove they were better at making borrowers pay up. When thousands of borrowers began defaulting on their loans, Obama changed the guidelines to favor companies that would work with people struggling with mountains of debt after college while they were still trying to establish a career. Loan officials griped that the new requirements were expensive and took up too much time. DeVos’ action signals a return to a more aggressive style of collection. According to the Institute for College Access & Success, Florida ranks low among states with an average student loan debt of about $23,000 for the Class of 2015. But with more than 2 million outstanding loans, government statistics from 2014 showed student borrowers in the Sunshine State were on the hook for more than $61 billion. More than 14 percent of the loans were in default, according to DOE statistics. Student loan debt nationwide is estimated at $1.4 trillion, more than credit cards and auto loans, and second only to home mortgages. According to MarketWatch.com, the debt increases by $2,726 per second. It’s clearly a significant problem, and with a new administration (and attitude) in Washington it means more aggressive steps to collect on those loans. 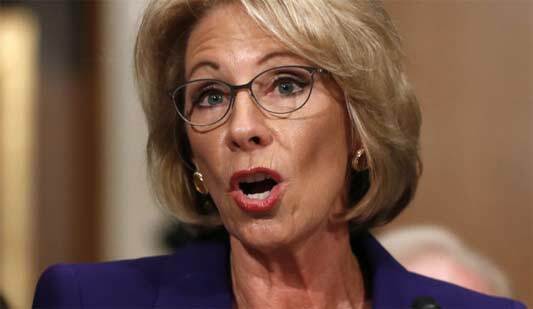 DeVos’ action was the first step. I applaud the actions taken to collect student loans. It is not a debt that I nor my family has taken on. As is indicated by the name – loan – it is a debt that borrower has made that is to be repaid. If the borrower cannot find employment in the field that their degree is in they need to find a job in one of the trades or they should have considered their chosen field when they took on their debt. Do not spend my taxes on your education and not expect to repay. Possibly the repayment could help to make social security solvent again.